The written word has the power to make an incredible impact on the world; it allows people to spread their ideas, creativity and truth in a timeless way. Before there were conventional writing tools, humans were already feeling the urge to document their thoughts. Avid readers began absorbing new knowledge through endless pages of books, and the influence these books had was unprecedented. 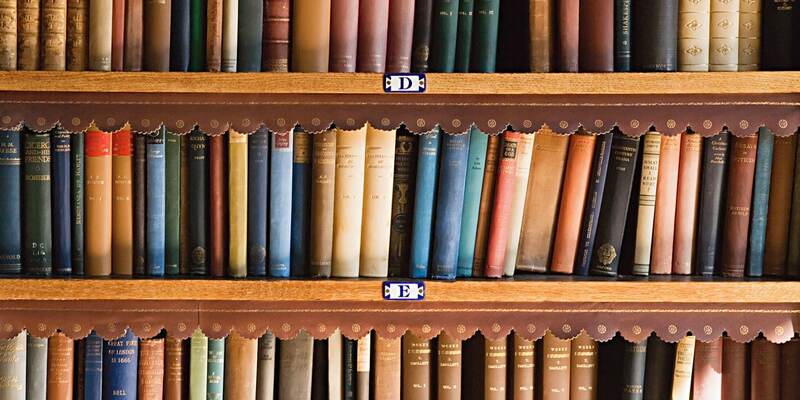 Many books have made an impression on society. However, only a select few of them have become international staples. These 25 books have changed the way we think, feel and perceive the world, and because of that, they will remain unforgettable. The Torah refers to the first five books of the Bible known as the Old Testament. These books include Genesis, Exodus, Leviticus, Numbers, and Deuteronomy. The Torah is one of the most impactful books in the world because it is the sacred book in the Jewish faith. The Torah was originally given to Moses orally by God on Mount Sinai in 1312 BC. Moses then put the words of the Torah down on paper in the following 40 years. The entire book was written by Moses himself, aside from the last eight verses which describe Moses’ death. The Torah is now used in Jewish religious rituals, and it is often read aloud in Hebrew. The Torah also contains many biblical laws within its pages. 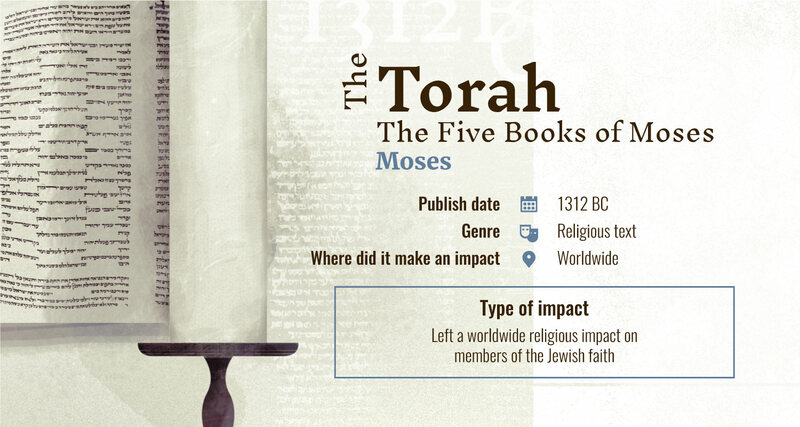 With a worldwide Jewish population of about 15 million people, it is clear that the Torah has made a large impact. “The Art of War” is an ancient military treaty from China that dates back to the 5th century BC. Written by military strategist, Sun Tzu, this document is composed of 13 chapters, with each chapter focusing on a specific aspect of military warfare tactics and strategy. 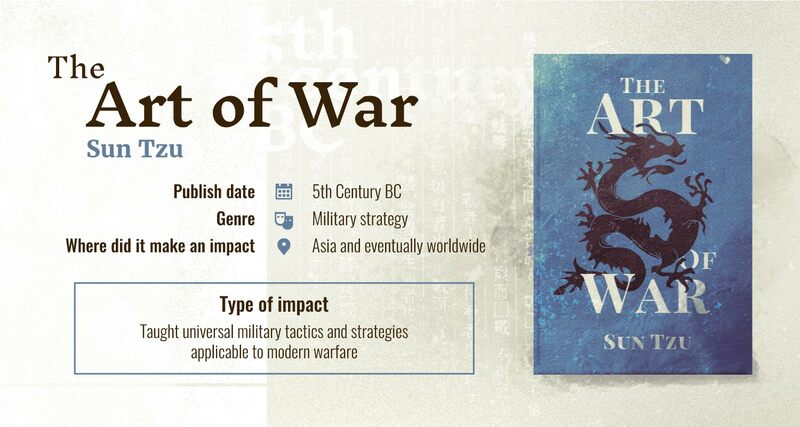 This book has remained an influential text in East Asian warfare for over 1,500 years, and its influence has spread to Western warfare practice in more recent centuries as well. This book has made such a large impact is because it provides timeless and teachable strategies that are universal in nature. 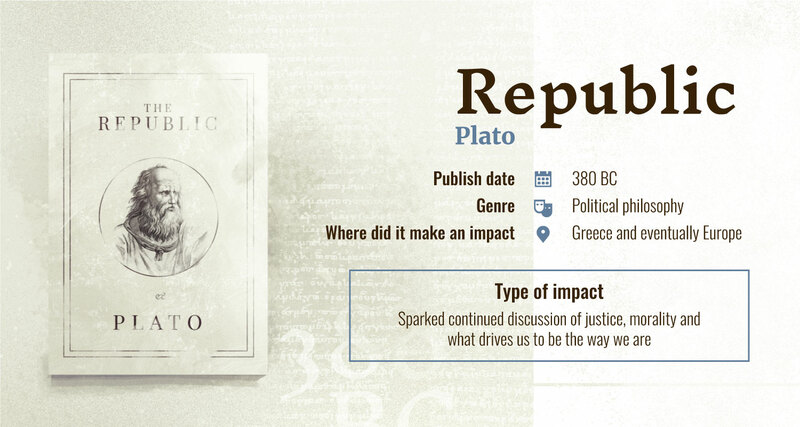 Plato’s “Republic” is a political dialogue in which Plato discusses the topic of justice. This has become one of the most impactful books in the world because it has challenged society for over 2,000 years to think philosophically about justice of the man as well as justice of the city-state. Colleges all over the world discuss Plato’s “Republic” and work through his ideas, trying to interpret his complex theories regarding morality, justice, and beyond. This book has challenged society to think more deeply about our internal consciousness. Plato’s Republic forces people to reflect on their personal being as well as on the moral code of others around them. The Qur’an means “the recitation,” and this book is the religious text of Islam. Muslims believe the Qur’an to be the revelation of God, or Allah, and one of the masterpieces of Arabic literature. 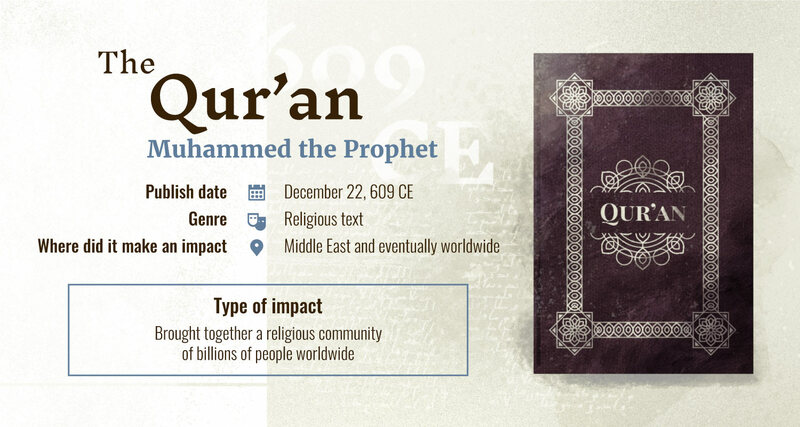 The Qur’an was given orally to Muhammad the Prophet over a period of 23 years, beginning on December 22nd, 609 CE. Muhammad died in 632, and a group of scribes helped compile the Qur’an to produce one complete manuscript. Islam is the world’s second largest religion, consisting of 24.1% of the population. With the Qur’an being Islam’s most sacred text, it is clear why this book has become one of the most impactful in the world. Aesop’s Fables have been around since the late 1400s. Aesop was a Greek slave storyteller who was believed to have lived between 620 and 524 BCE. These fables were originally told orally, but were then collected and recorded on paper long after Aesop’s death. The fables cover social, political and religious themes, but ultimately their purpose is to be ethical guides. Because Aesop’s Fables had such a large impact on society, the “fable” has turned into a genre of its own. “Fable” now refers to any fictional story which has a moral to it. Many of Aesop’s Fables, however, are contradictory in the lessons they provide. The contradictory nature of the stories make it questionable that the original Aesop’s Fables were actually written by Aesop himself. 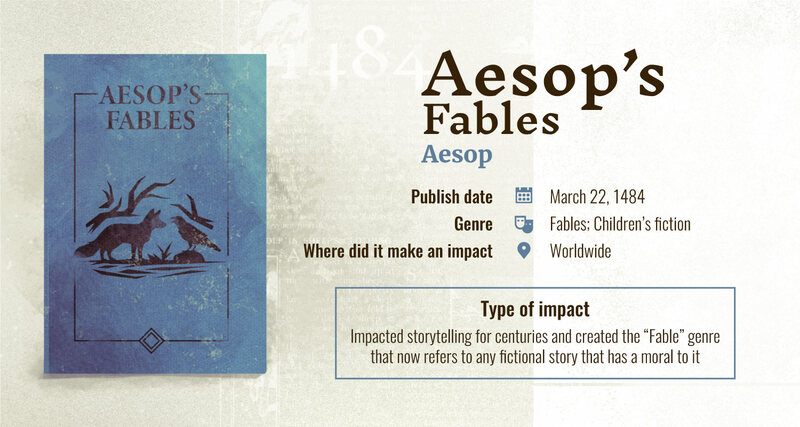 While it is unknown how Aesop’s Fables actually came to be, it is clear that these stories have had a large and enduring impact on literature and storytelling throughout time. The King James Bible is the English translation of the Christian Bible, which was translated for the Church of England under the supervision of King James I in 1611. The Bible consists of 39 books of the Old Testament as well as 14 books of Apocrypha and 27 books of the New Testament. 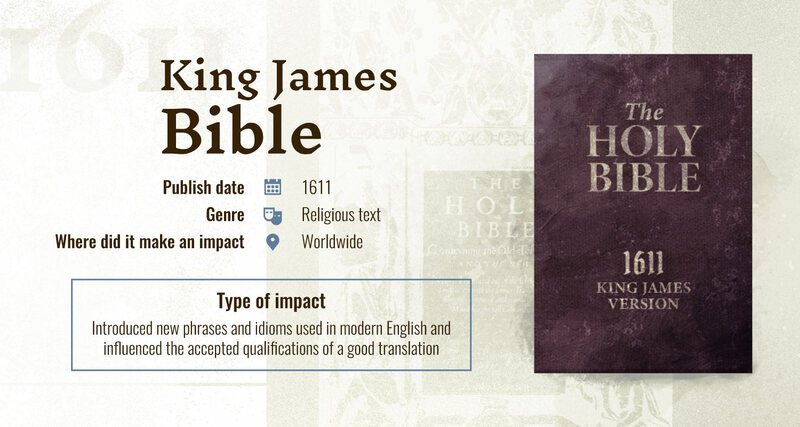 The King James Bible is the most commonly used bible in the Christian faith worldwide, and it arguably the most impactful book in the entire world to date. The Christian faith is the most popular religion in the entire world, with 31% of the population practicing it. This book is the Christian holy book. Phrases and idioms from this version are still used in modern English. 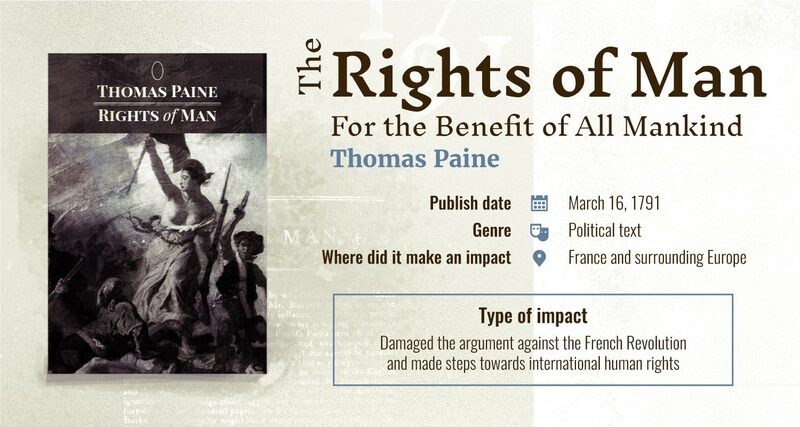 “The Rights of Man” is a political text written by Thomas Paine in the late 1700s, which contains 31 articles discussing and defending the French Revolution. Paine argues that the French government does not protect the natural rights of its people. Though Paine was an Englishman, he strongly supported the revolution. He published his book in 1791, but later withdrawn for fear of prosecution. It was soon released again and sold over one million copies because Paine’s thoughts were so controversial and brave. Paine touches all points of natural rights in his book, including heredity rights, elderly rights, youth and education, welfare and more. He includes ways to improve these rights for citizens, and his literary work was seen as a revolution of its own. His political action made a huge impact during this time period, and people still read about it to this day. 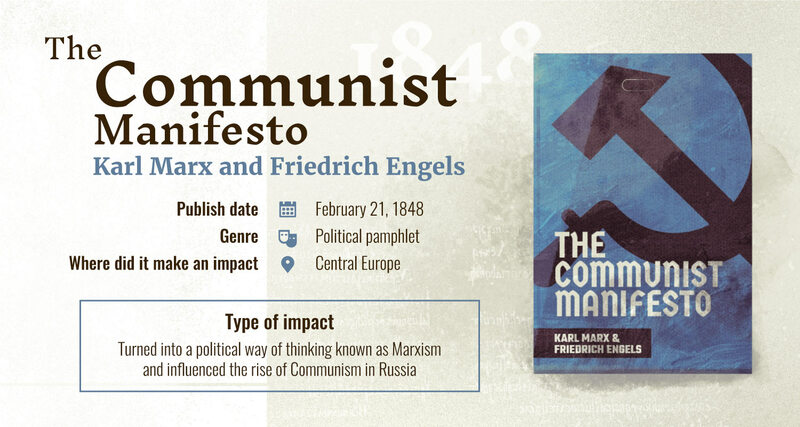 “The Communist Manifesto” is a political pamphlet that was written in the mid 1800s by Karl Marx and Friedrich Engels, who were both German philosophers. In this text, Marx and Engels discuss their theories regarding society and politics. Ultimately, they believe that class struggles have been a major factor in society and that communism will help to solve these class issues. This book has become very influential, because many believe that Marx “foresaw it all.” His theories can still be applied to modern day politics and economics, as if he knew what the world was going to be dealing with in the future. People have taken the writings from this book and turned them into a form of thought called Marxism. 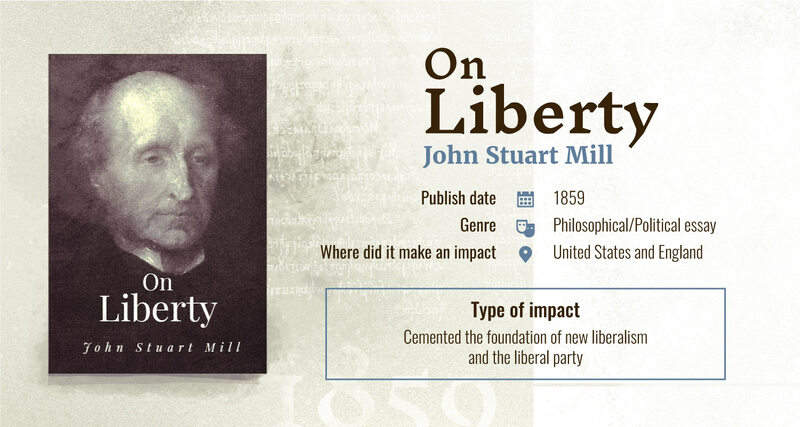 Written by English philosopher John Stuart Mill, “On Liberty” is a short essay which takes Mill’s idea of utilitarianism, also known as the maximization of well-being, and applies it to both government and society. Mill tries to emphasize individuality and create an equal relationship between authority and liberty, because that is how utilitarianism is achieved. While this book was extremely influential with the liberal political party, it also received a lot of criticism by conservatives for its vagueness. Mill explains that the oppressiveness of the government needs to be controlled by the liberty of the citizens, and this is something that many liberals can get behind. “On Liberty” was published in 1859, but it has remained a book of wide impact and discussion in modern day literature and politics. Its controversial nature is what has kept it relevant. 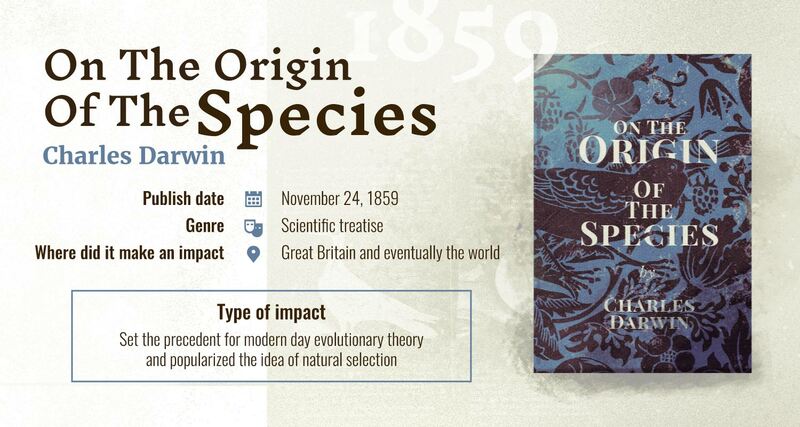 “On the Origin of a Species” is a book of scientific literature written by Charles Darwin, who was a biologist, geologist, and naturalist. This is one of the most impactful books in the world, because it explains the theory of evolution and is said to be the foundation for evolutionary biology. Darwin explains in this book how species evolve over time through natural selection. He includes scientific evidence for his theories, which he gathered on his Beagle expedition in the 1830s. One reason Darwin’s theories were so impactful because, scientific belief was closely tied to the Church of England during this time period. Despite this opposition, the world eventually became accepted and believed his book over previous scientific beliefs that had strong theological influence. 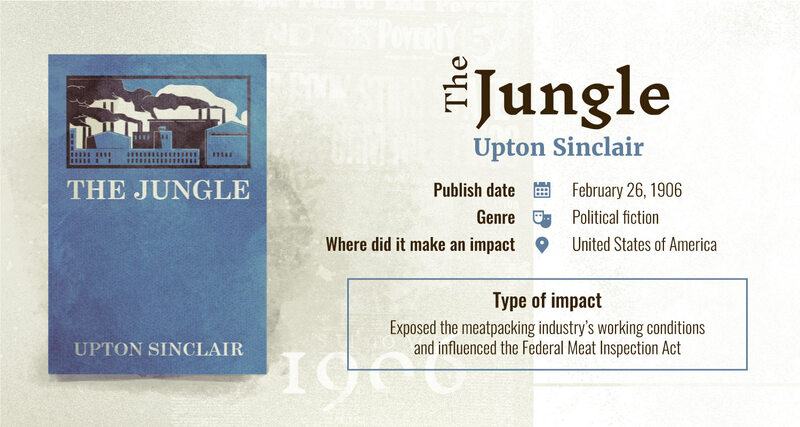 “The Jungle” was written by Upton Sinclair in 1906. This novel helped expose the harsh conditions in which immigrants were working in the United States in industrial cities such as Chicago. It also exposed a wide range of unsanitary practices and health violations which were taking place in the meatpacking industry during the early 1900s. While Sinclair’s goal was to speak to the hearts of Americans and advance socialism, he also spoke to their stomachs and in turn, reformations of the Federal Meat Inspection Act (FMIA) took place. The book made a large impact on society by depicting a sense of hopelessness among workers who were forced to work in terrible conditions under corrupted people in power. The hearts of Americans were shaken up by this novel, and it caused significant political change, which is what Sinclair hoped for. 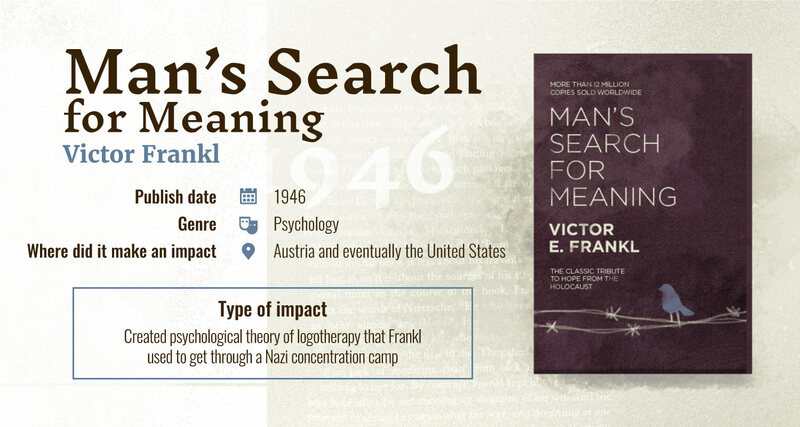 In “Man’s Search for Meaning,” we hear the story of Victor Frankl, who writes his experience after being a prisoner in a Nazi concentration camp during World War II. In order to survive this terrible time, Frankl used a psychotherapeutic method, in which he found something in his life that gave him purpose and thought positively about it in order to motivate himself to keep going. He called this theory logotherapy. This book was seen as a psychology book as opposed to just a memoir. The book became one of the most influential books in the United States after Frankl’s death, with over 10 million copies sold. It has been translated into over 24 languages and Frankl’s methods are still studied and discussed. 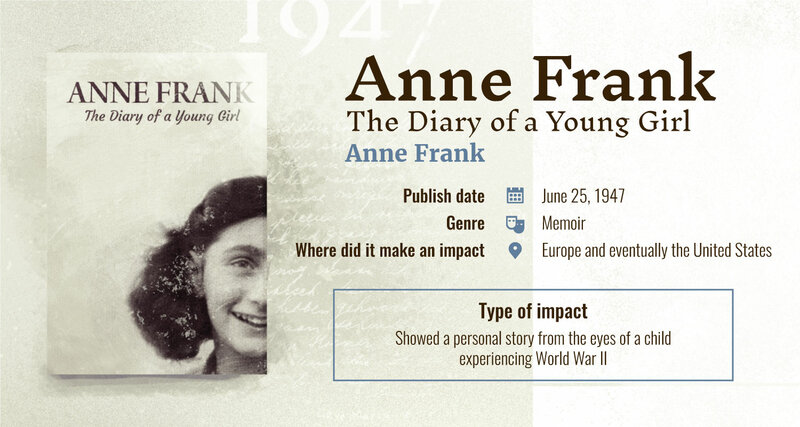 “The Diary of a Young Girl,” written by Anne Frank, is a memoir of Frank’s two years in hiding while the Nazi’s were occupying the Netherlands. Anne Frank’s father was the only survivor after the war, because the family was caught and put into concentration camps. Anne Frank died of typhus in 1945. The diary was found and given to her father and has since been published in over 60 languages. This book had an incredible impact on the world because it portrayed a raw and real experience of a young girl during World War II. To this day, the book is taught and read in schools worldwide when World War II and the Holocaust are studied. This book introduces a relatable way for kids to think about this time period and understand the significance of the tragic events that occurred. “1984” is a novel written by George Orwell. This novel is set in a dystopian society where the government is constantly watching civilians through an omnipresent surveillance system. Civilians are victims of perpetual war and independent thinking is illegal. The Thought Police punishes both thought and individualism of any kind. Smith, the main character, rebels against society by maintaining a taboo relationship with a woman named Julia. This famous work of political fiction has made a large impact on society and it has become one of the most well-known works of literary fiction. Words in the book such as Big Brother, doublethink, and thoughtcrime are commonly used and understood in everyday language today. 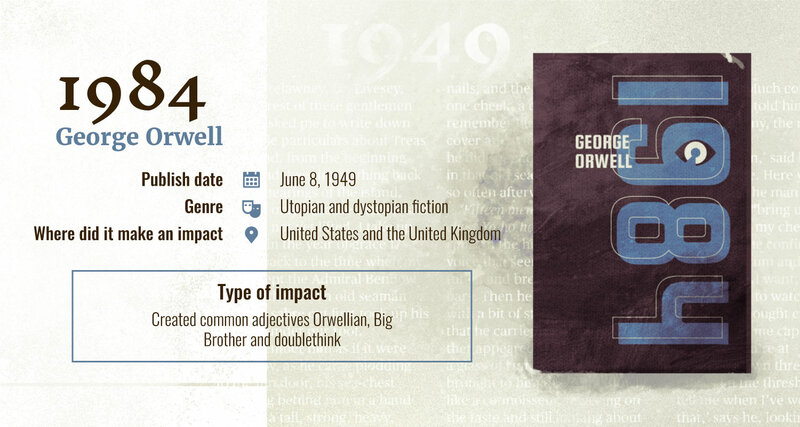 The adjective Orwellian has been created on the basis of the novel’s themes. 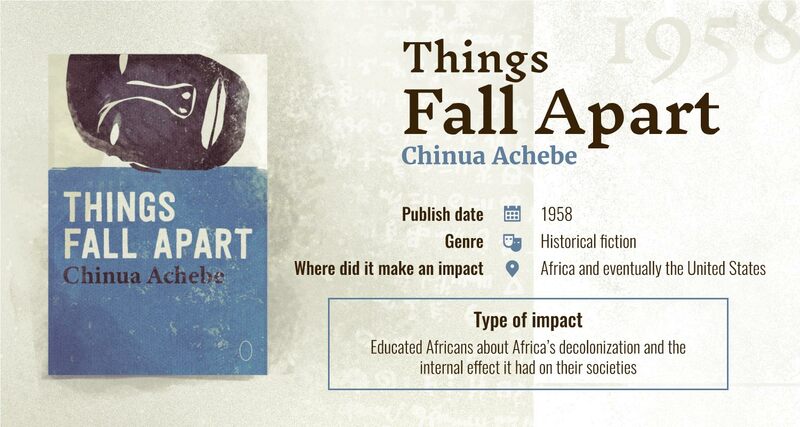 “Things Fall Apart” is a novel written in the mid 1900s by Chinua Achebe. The story is an account of pre-colonial life in Nigeria and tells the tale of the European’s arrival during the late 1800s. Okonkwo is the main character in the novel, and he is a wrestling champion in Nigeria. Okonkwo must deal with white men changing his homeland and converting his village to Christianity. Okonkwo is taken prisoner when he returns from a long exile and refuses to conform to the white man’s teachings. The tale ends in tragedy when Okonkwo tarnishes his own reputation and commits suicide. This historical novel is taught in African schools and discussed throughout the United States. Achebe portrays decolonization and internal colony struggles in a realistic way. The significant theme throughout the novel is the friction seen in the Igbo society as they struggle to deal with the invasion of European government. 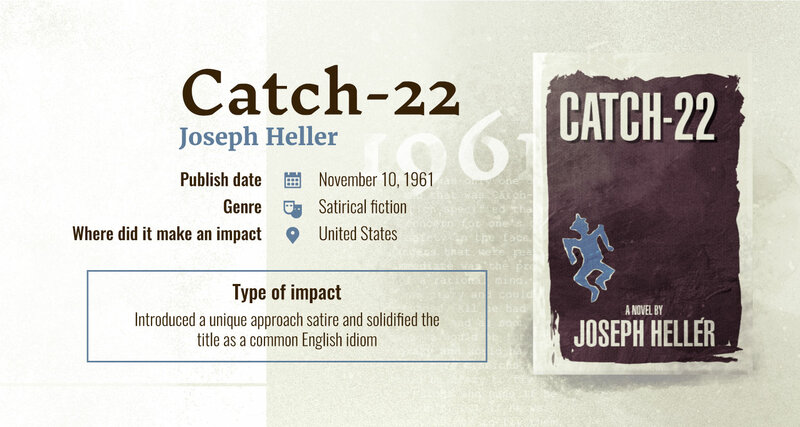 Written in the mid 1900s by Joseph Heller, “Catch-22” is a satirical novel set during World War II which follows the life of Captain John Yossarian, a member of the U.S. Air Force. Yossarian and his squadron are based on the island of Pianosa, and the novel chronicles their experiences to maintain sanity while trying to get their job done so they can eventually return home. The novel is chronologically inconsistent and hops between different character’s point of views. The book is called “Catch-22,” because of the many inconsistencies throughout the novel regarding timeline, time period, and general absurdities. “Catch-22” made an impact on the world that was both very positive and very critical. Some praised it for its creativity and others considered it to be a rollercoaster. Regardless of its reception, it made a lasting impression. 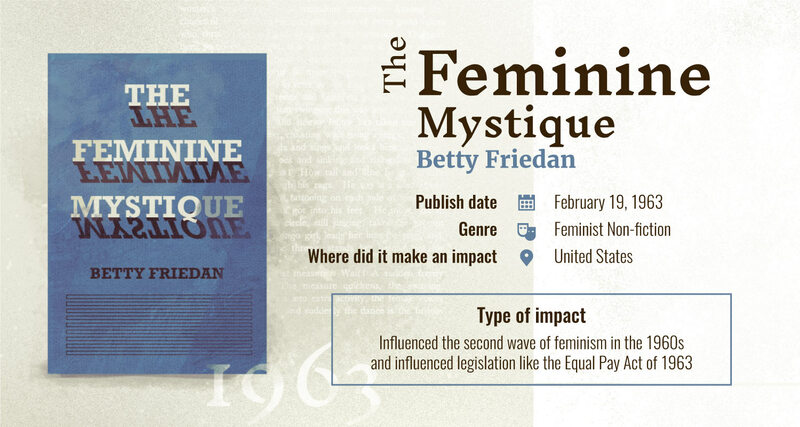 “The Feminine Mystique,” written by Betty Friedan, started the second wave of feminism in 1963 and became one of the most impactful books in the world. In this book, Friedan builds on the study she conducted of her classmates at Smith College where she found that many women are not happy as housewives. She expands upon this theme throughout her book and argues that women are going against the feminine mystique and branching out into more independent lifestyles. She makes a stand for female empowerment and calls for a change in the meaning of feminism. “The Feminine Mystique” became the starting point for a political women’s movement in which many new forms of activism were jumpstarted. The 1960s were a monumental time for women and many people attribute this to Friedan and her writing. “The Autobiography of Malcolm X” outlines Malcolm X’s spiritual conversion to Islam and discusses his outlook on black pride and black nationalism. 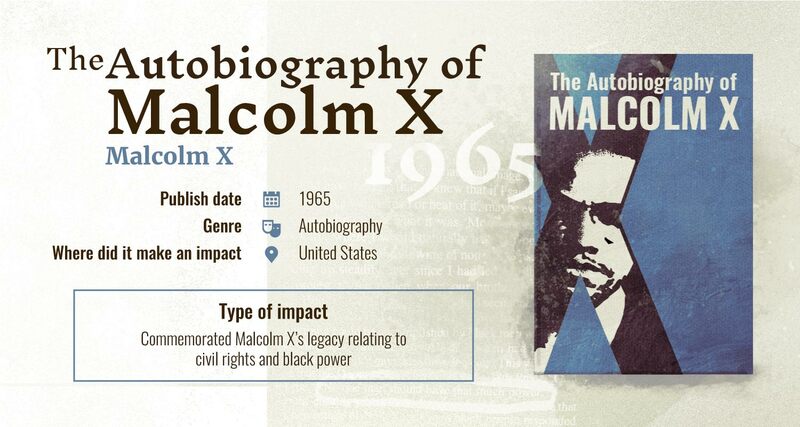 This book was published posthumously and became a monumental for society because Malcolm X was a thought leader in the black power movement of the 1960s. Malcolm X was an icon because he employed a message of both anger and love, which was hard to interpret and yet very relatable for many African Americans. He was in opposition with Martin Luther King Jr. during this time period, yet they were both fighting for the same cause. This autobiography continues to be discussed nationwide when learning about the Civil Rights Movement. Malcolm X’s teachings were uniquely his own and will never be forgotten. 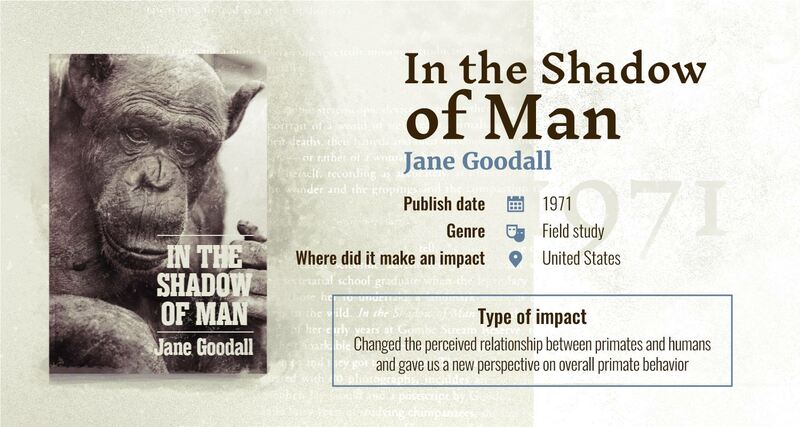 “In the Shadow of Man” is written by famous anthropologist and primatologist Jane Goodall. This book made a large impact on the world, because it tells the story of Goodall’s early years at the Gombe Stream Reserve where she worked closely with chimpanzees and studied their every move. Goodall learned through her studies how the family relationship between chimpanzees are closely related to humans. She also learned how their behavior is strikingly similar to us in every way, including their deepest thoughts and feelings. This book has sold millions of copies worldwide, and it has changed the way society thinks and relates to primates. We no longer see them just as animals, but we know that they are the closest species to us as humans. 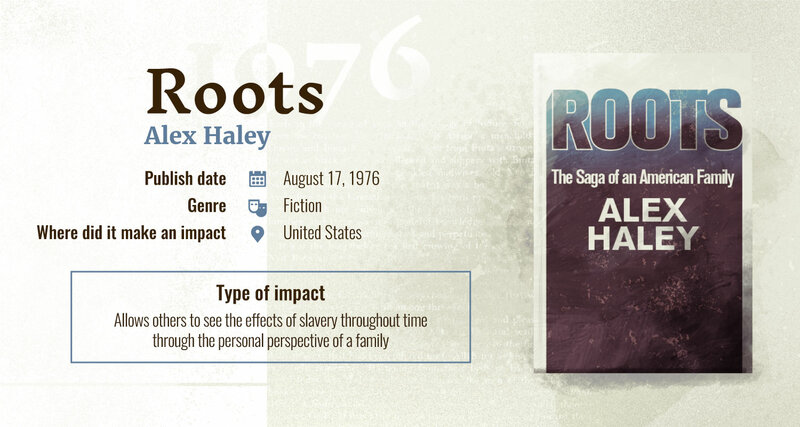 “Roots,” written by Alex Haley, tells the story of young Kunta Kinte, who is living in Africa in the 1700s and sold into slavery and sent to North America. The story follows his life and continues on into the stories of his offspring. This book was turned into a popular television series and eventually became a cultural phenomenon throughout the United States. This is an important piece of historical fiction because it teaches the world about slavery and shows the personal experience of a young man going through it firsthand. In “A Brief History of Time,” famous British physicist Stephen Hawking discusses cosmology and the study of the universe. 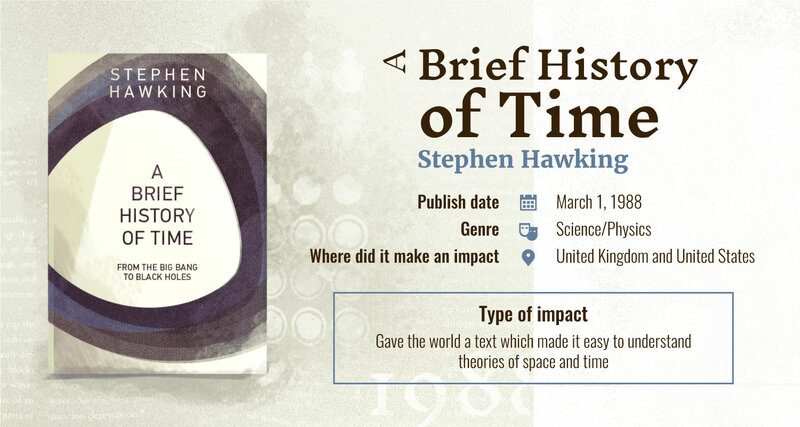 The book made a huge impact on the world because Hawking wrote this book using non-technical terms so that the general public could understand his theories. He explains the basic concepts of space and time, describes the Big Bang, black holes, the theory of gravity, and other revolutionary cosmic theories. Hawking sold over 10 million copies of this book and changed the way the world discusses space. Without this book, science would not be the same and the general public would not understand space and time as clearly. Hawking did a great service by offering his findings in such an accessible way. This book has become one of the most impactful in the world, selling over 25 million copies and being translated into 40 languages. It is one of the bestselling nonfiction business books in history to date. 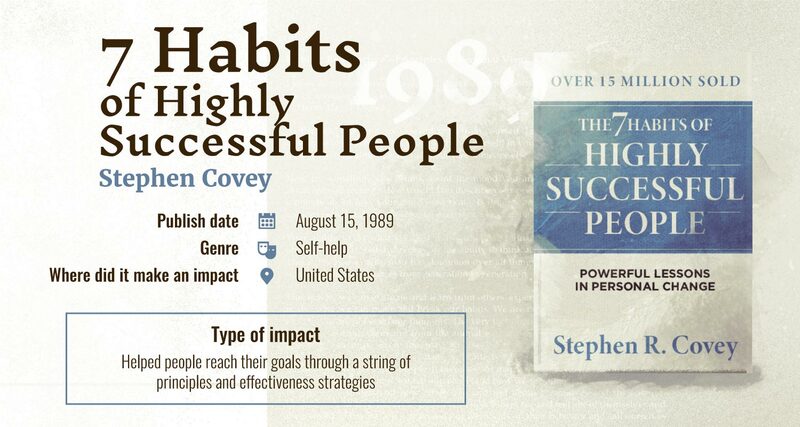 Even President Bill Clinton asked Covey to come advise him on how to implement the strategies from this book into his presidency. 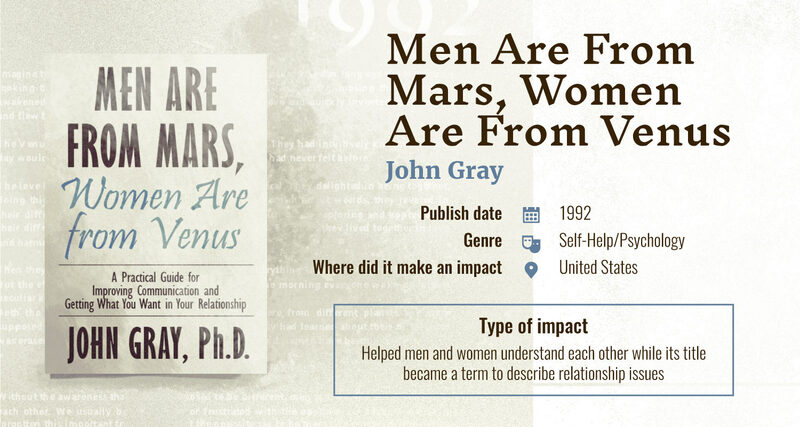 “Men Are from Mars, Women Are from Venus” is written by John Gray, who is a relationship counselor. In this book, Gray addresses common relationship issues between the sexes which are a result of psychological differences. He uses the metaphor that men are from Mars and women are from Venus to explain that each gender has its own society and customs that they are acclimated to, and they have a hard time understanding one another because of this. This book made an impact on society because Gray helped people understand why men and women have miscommunication issues. The metaphor became so popular that it took hold in pop culture and became the name and theme for many various brands in entertainment, apparel, leisure and beyond. 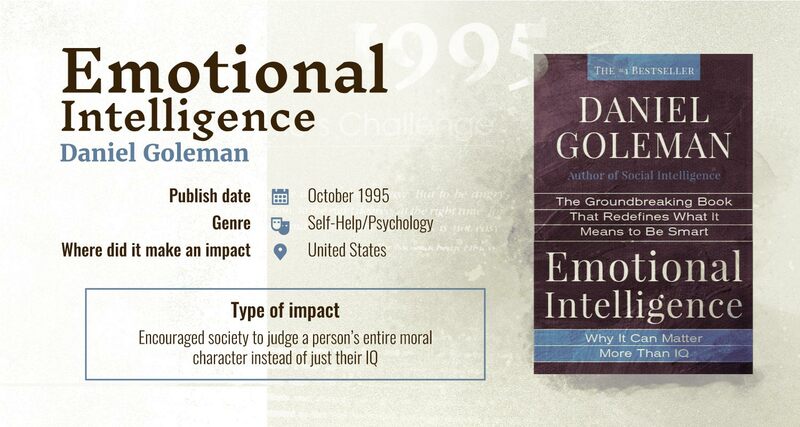 In “Emotional Intelligence,” Daniel Goleman argues that a person’s EQ is more important than their IQ. He uses behavioral research to show that empathy, self-discipline, and self-awareness — qualities that he uses to measure emotional intelligence — are far more important than the measurements used to measure the simple IQ. Emotional intelligence can also be strengthened throughout adulthood, and it shows much more about a person’s character. This book made a huge impact on society because it challenges the way we measure intelligence and takes into account more than general knowledge. Goleman helps the world see the value of a person’s whole personality instead of their educational skills alone. 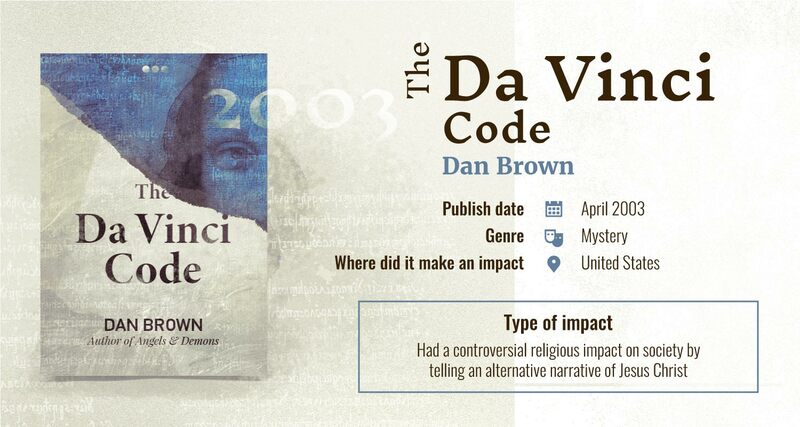 “The Da Vinci Code” is a mystery novel written by Dan Brown. After a murder occurs in the Louvre museum, symbologist Robert Langdon and cryptologist Sophie Neveu get into a debate over Jesus Christ being a possible companion to Mary Magdalene. The novel goes on to explore this substitute religious narrative. It made a huge impact on the world, because it was strongly criticized by the Christian faith, and more specifically by the Roman Catholic Church, for its implications that the original story of Jesus Christ was mistold. However, many readers became enthralled in the story, and it sold 80 million copies worldwide. It was also translated into 44 languages and adapted into a motion picture film. The most impactful books in the world have crossed continents and language barriers. These books have challenged political thought, scientific research, religious faith, literary themes and philosophical theory. Each writer in this list was a revolutionary in their own right. We value their opinions because they were brave enough to take their thoughts and share them with the world, regardless of criticism they might receive.